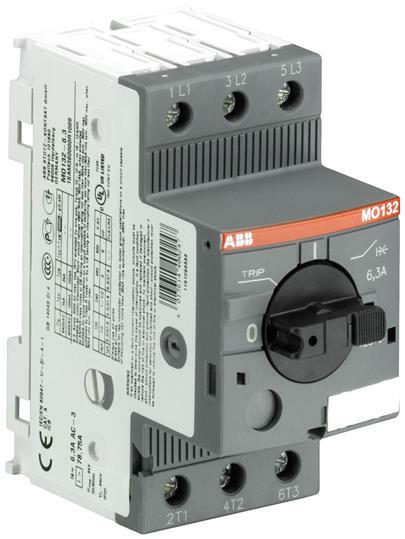 The MO132 manual motor starter mangnetic only is a compact 45 mm width devices with a rated operational current of Ie = 0.16 A. This device is used to manually switch on and off loads/motors and to protect them reliably and without the need for a fuse from short-circuits. The manual motor starter offers a rated service short-circuit breaking capacity Ics = 50 kA at 400 VAC. A combination together with overload relays or motor controllers allows the protection of motors. Further features are the build-in disconnect function, trip-free mechanism and a rotary handle with a clear switch position indication. The manual motor starter mangnetic only is suitable for three- and single-phase applications. The handle is lockable to protect against unauthorized changes. Auxiliary contacts, signalling contacts, undervoltage releases, shunt trips, 3-phase bus bars, power in-feed blocks are available as accessory.